Discussion in 'Educational videos and material' started by StockJock-e, Apr 3, 2016. 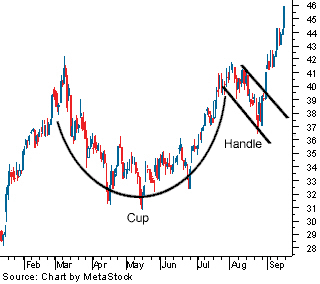 Welcome to Technical Analysis 101. Have a seat and pay attention, there will be a quiz at the end. So what is technical analysis (TA)? Simply put TA is the use of charts to identify patterns and predict future activity. It is impossible to accurately predict the future, but by understanding investors emotions, you can always try keep one step ahead of the pack. Many different factors effect the price of a stock, anything from weather, inventory, fed interest rate hikes, inflation, sales and so forth. Stocks go up and down and there is little we can do to predict exactly how a stock will react tomorrow. What we can do however is look at what a stock has done in the past, and from that, gauge an approximation of how it should act in the future. Step one: Looking at a stock chart. The first thing you want to do is change your chart from a line chart to a bar chart. Lines are nice, but they dont give us enough information about what a stock did intraday. A bar chart shows us the open, the daily move and the close (candlesticks also do this, but we will get to those later). The importance of having a barchart (or candlesticks, which are similar) is that it allows you to quickly see the range your stock has traded within in that time period. The "range" is the highest and lowest level in that period, this will be important later when we learn about candle sticks. Now that you have a bar chart, lets do the most basic of all analysis, lets look for support and resistance levels. 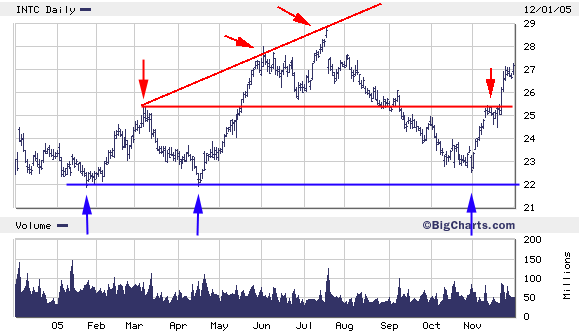 Finding support: Starting from the left in Jan 2005, (first blue arrow), you can see that INTC hit the $22 level, then rallied. In April the stock dropped and hit $22, the rallied again. It seems that $22 is a nice support level. Investors are basically thinking "Hmm, I like INTC and would buy it if it hit $22..." and so they do. If we connect those two support levels and extend the line to the right, it shows us a nice long term support level. 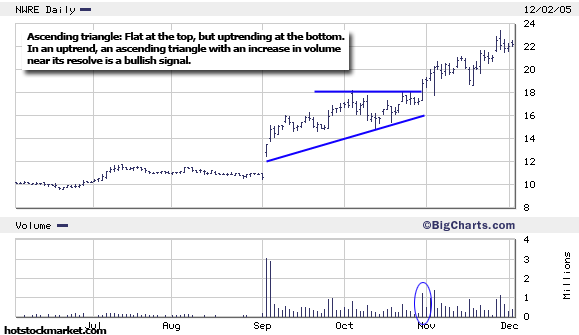 Finding resistance: After that first support was found, the stock rallied, but then stalled at $25.50 in March. You can see that in May, the stock blasted right through that resistance level. Note that support and resistance levels do not have to be horizontal, in fact they can be almost any angle. INTC hit $28 in June, and pulled back, that is another resistance point. By connecting the March and June peaks, then extending the resistance level outward, we find that the next resistance point in July was predicted correctly! Later in November we can see that the old $25.50 resistance stalled the rally, but as soon as it broke through, it moved quickly. Think of support and resistance levels as jello like barrier, sometimes a stock will bounce off them, other times it will cut through. Note: A stock will not change direction because you drew a line on a chart, but if enough traders and investors are all looking at the same levels, this can become a self fulfilling prophecy. Be aware of what others are are looking at and try use it to your advantage. twerpner, bigwin1234, Austin vanderweide and 5 others like this. Perhaps the most basic of all indicators is the moving average. It is exactly what it sounds like. If your wife spends $100 today, and $110 tomorrow. Her average spending is $105. Stocks move every day, so if GE (General Electric) closed at $30 yesterday, then at $30.50 today, the average over the past two days is $30.25. Now lets stretch this out over say... 200 days, we would get a line showing us the average closing price over that time period. I did not randomly pick 200 days, the 200dma (day moving average) is actually one of the most commonly used indicators. Even those traders or investors who have no clue about technical indicators would know about the 200dma. It is basically the trend line that if a stock is above it, it is doing good, if it is below it, the stock is doing bad. This is obviously an extremely generalized point of view, but it gives us a general frame of reference. The 200dma is best used with major indices and blue chips, not small or mid cap stocks. 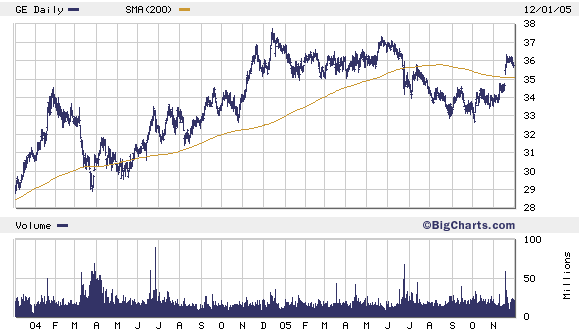 Let us take a look at the 200dma as applied to GE:NYSE. As long as the stock is above the 200dma, it is considered to be in a healthy uptrend. A strong move below the 200dma would indicate some volatility, and if the stock stays below the 200dma for an extended period of time, it is an indication of continued weakness. The trend of the 200dma itself is important. If the 200dma is uptrending, that tells us the underlying security is in a strong long term uptrend. If the 200dma is downtrending, then the opposite. A stock will often move above and below the 200dma, but as long as it is in an uptrend, its ok.
Austin vanderweide, Value543, leonx81 and 2 others like this. If you want to know the long term trends, a 200dma is fine. But what about shorter term moves? The same concept applies to short term moving averages. Daytraders will use moving averages based on 14dma or even 5dma for general trends, they even get down to 5min and 1min moving averages, but we are not daytrading here. Let us focus on long term and mid term trends for now. Instead of a 200dma, lets use a 100dma and also a 50dma. An interesting thing happens when you put two different time frames together, you get two lines that move around each other. 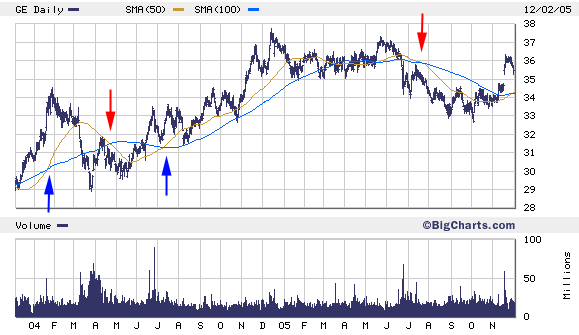 The blue line is a 100dma, you can see how it showing the general trend of the stock. The brown line is a shorter term 50dma, it is more volatile as it more closely follows the actual day to day moves (averaged over 50 days). Here comes the fun part: See how the 50dma moved above the 100dma Jan 04 (first blue arrow). This indicates to us that the short term trend was extremely stronger to the upside than the longer term 100 day trend. As you can see, the stock did indeed hit some nice highs. You will also note the opposite (red arrow) when the 50dma fell below the 100dma. Look at July 04, see how the 50dma once again moved above the 100dma? I good indication of short term strength kicking in. GE went from $32 to $37 over the following months. Now look how the trend changed when the 50dma fell below the 100dma in July 05, this indicator told us that weakness is kicking in and GE subsequently dropped from $35 to $33. Think of moving averages like these as a windsock, they are merely showing you which way the wind is blowing! Next lesson - combining what we have learned so far. bigwin1234, Value543, leonx81 and 1 other person like this. Believe it or not, after just these three simply lessons you already have the tools for basic technical analysis... very basic though. As you can see, in the early part of 2005, the $35 area was strong support. We also see some overhead resistance that stopped the rally in May 2005. Now watch how this signal works out, we see the stock break below $35, next we see the 50dma cross under the 100dma. What followed was a continued drop to $33. If you were a trader, you would have exited the stock at $35 and saved yourself that drop. That $33 area is also a support level. Can you see why? You could have used $33 as a re-entry into the stock if you like playing bounces off support levels. Value543, leonx81 and T0rm3nted like this. Chart patterns will by far be your most reliable friend when it comes to trading when combined with other indicators. Since you are already familiar with support and resistance lines, you will find that chart patterns are a simple extension of that concept. Do not be scared! This is really not that bad! All I am going to do in lesson 5 is introduce you to two friends of mine, they are basic oscillating indicators, one is called RSI (Relative Strength Index) and the other is MACD (Moving Averge Convergance Divergance). I have put RSI at the top of the chart, MACD is at the bottom. The calculation for RSI is 100-(100/ 1+(U/D)) where U=avg upward price change and D=avg downward price change. RSI is a oscillator that ranges between 0 and 100. The standard time period that you will find it set at is usually 14 days. Traders will often change this 14d period to make it suit their style of trading. Shorter term for daytrades, longer term (21-50days) for longer term trading. Simply put, an RSI reading over 70 indicates an overbought situation, below 30 is an oversold situation. Some traders use the peak RSI as a buy or sell signal, others wait for a cross over back below or above the 70 or 30 level to indicate a buy or sell. This indicator shows you the 'internal strength' of a security. There is also an important divergance signal RSI gives us, take a look at how GE made a new high in Oct but RSI did not. MACD is a momentum indicator that shows the relationship between two moving averages., it is best used in wide swinging trading. MACD is uses crossovers, overbought/oversold conditions, and divergences. Using the same concept from our moving averages tutorial, when one line crosses above the other, note how the red line crosses the black like at the first green arrow, thats a buy signal. The opposite is true at the red signal. Important note: No technical indicator is 100% correct. 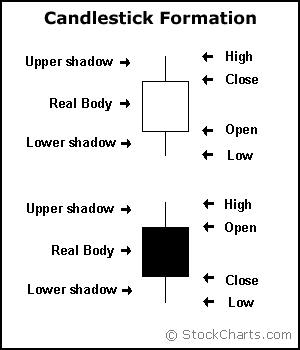 As you become more advanced, you will pick out and combine indicators which suit your trading style. Important note #2: These are the basics of these indicators, things get increasingly complexed the more you get into it. This paragraph is probably the most important one you will read, so pay close attention. The most important thing to remember when you are using charts to try gauge levels of fear and and greed (which is exactly what you are doing here) is that the market will do what it wants to do. The market, or a stock does not care if a line says there is support, or if an indicator says it should be oversold. Technical indicators do not tell the market what to do, its the other way around! 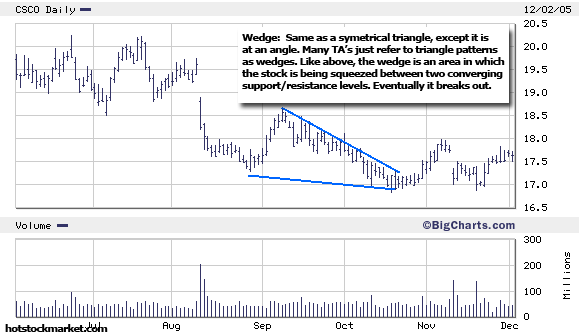 Technical Analysis is just a tool, much like a hammer is a tool. Just because you have a hammer does not mean you can build a beautiful house. Remember this and you will understand one of the most important lessons in trading you will ever learn. 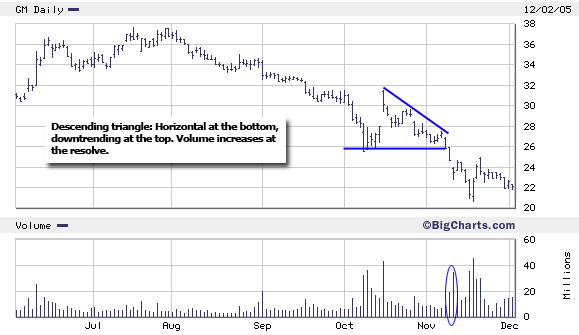 Technical analysis tries to find trends and patterns in this noise. All you need to do is be better then 50% correct. If you can be right 51% of the time, and if you can manage your losses, that is all it takes to be profitable in the long run. I hope this fast tracks you into the TA part of your investing education! http://www.babypips.com/school/ - Primarily a FOREX site, but techicals are the same anywhere you go, good educational articles. Neanderthal, mcb1961, bigwin1234 and 5 others like this. Thanks, quick and to the point! This an amazing starting point for beginners. Thanks for the well written intro to technical analysis, this is something I needed to point me in the right direction. But yeah, we want to start expanding some cool services soon! 5lyaway and SundownXIII like this. I am getting daily knowledge on technical analysis, good to have this tutorials. Read it over a few times, probably just in chunks. Look at some charts and see if you can spot any of these indicators. It's really a tremendous post from @StockJock-e and covers the majority of the indicators you need to successfully trade a stock using the chart (technical analysis). Getting knowledge on technical analysis, good to have this tutorials.